Solimo is one of the many Amazon brands available from amazon.com that sells a variety of sport and nutrition supplements. 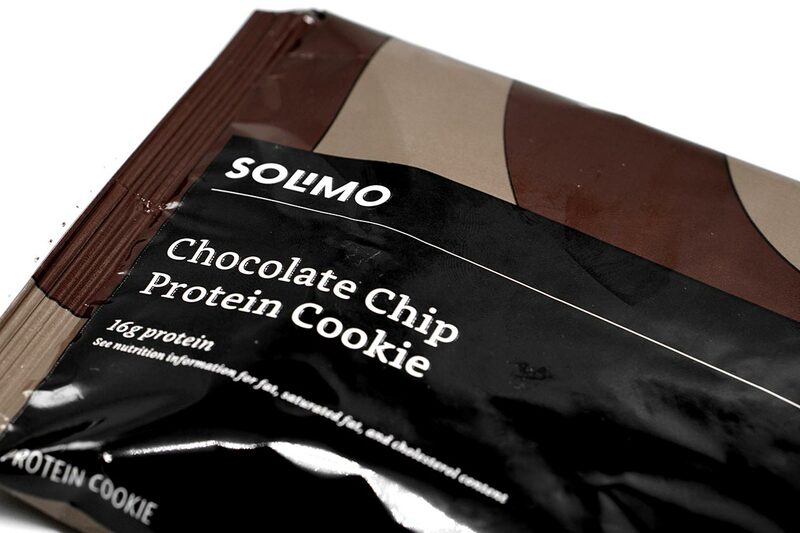 We actually hadn’t tried any products from Solimo before today, so we recently decided to grab one of its more recent releases with the protein-packed, Solimo Chocolate Chip Protein Cookie. The macros on the protein snack aren’t anywhere near the likes of a typical protein bar or even its competitor, the delicious Quest Protein Cookie, but they aren’t too bad. A single 75g Solimo Protein Cookie packs 16g of protein with 20g of fat, 23g of carbohydrates with 8g of that fiber and 9g added sugar, and a total of 340 calories. The Solimo Protein Cookie is not too bad when it comes to taste and texture, although we kind of expected that based on its nutrition profile. The body is surprisingly soft and very easy to sink your teeth into, and unlike a few other cookies we’ve had, the product doesn’t take all that much effort to chew and swallow. The consistency of the Solimo Protein Cookie is as mentioned, soft and fairly muffin-like with the Chocolate Chip flavor not really having too much taste to its main body areas. The product does, however, pack sweet concentrations of flavor by way of its chocolate chunks which are scattered throughout the protein snack. The chocolate pieces in the Solimo Protein Cookie truly make it a great tasting and enjoyable product. We didn’t have a bite where there wasn’t at least one chocolate chunk. The chocolatey pieces give the cookie a very realistic chocolate sweetness that lingers and keeps you satisfied from bite to bite. We’re actually quite impressed with the Solimo Protein Cookie, mostly due to how easy to eat the product is. Its soft and fluffy muffin-like consistency makes it a protein snack that’s difficult to put down once you’ve taken that first bite. The chocolate chunks essentially seal the deal, with a delicious chocolate taste that completes the whole experience.